On May 3, 2014 I was reading a story on the news about some hikers who shot some video near Squamish, British Columbia. Having done several hikes and peaks in that area I clicked the youtube video. They are on a mountain hike looking down where, far below something is walking across the snowfield . They are unsure what it is but due to the location ["remote"] and the way it moved, they suggest it may be a Sasquatch. As I watched, he mentions that he is on Tricouni mtn., it is 2011 and he does a quick pan across the valley. That was when my jaw dropped and eyes opened wide. I stopped it right away and looked back at my hiking photos. 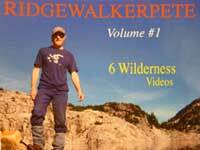 Sure enough, I was up there during the last week of July 2011 gathering video and still photos for another episode of Ridgewalkerpete. There was a huge snow pack left over from the winter that year. It was sunny and warm way down at the bottom by the high falls and well up the trail until you got to the higher elevation where suddenly it goes from grassy with plants to one meter of melting snow. I was extremely concerned about avalanches so I stayed away from the steep slopes and after a few tries decided not to go up to the peak. My main objective is get back safely, particularly so the nay-sayers who think you can't go solo without disastrous consequences don't get a big 'I told you so'. For about six days I was walking all around exploring the valley, stubbornly holding that altitude even though there were summer conditions lower down the mountain. On my 2011 blog entry I told the story of my lone water bottle sliding off the cliff where I was camping. It took several searches over a few days to find but as I think back it was good to have a task, something to take my mind off not going to the peak. Tricouni mtn' will be the next video. I have most of the editing done but have not worked on the music. Now I have more for the story and have a better angle to cover. Something I think a lot of people don't realize is that for a large critter like Sasquatch to survive today it would have to have a viable breeding population which would require a lot of food, year-round water , housing, paths to get around and they would tend to live on the valley bottoms where humans are likely to go. During several decades of hiking around in the back country as well as working in the bush I know that there are all kinds of people who poke around the nooks and crannies of wilderness looking for minerals, oil, stands of trees, archeological artifacts, accessing climbing walls or just enjoying some of the last bits of old-growth forest. Somebody would have discovered a colony or a dead one. I am aware of the theory that those who see a Sasquatch are viewing something from another dimension but I'll leave that for others. I will keep an open mind, continuing to watch out for whatever crosses my path. If it was during the last week of July 2011, that critter might be me!